Unlike humans, angels neither procreate (Matt. 22:30) nor die. The angelic population was fixed at its creation (Neh. 9:6), leaving no need for a periodic census. Revelation 12:4 indicates that Satan lured one-third of the angelic population to defect and join his rebellion against God. These became evil angels. Two-thirds of the angels have remained faithful to God as elect angels (1 Tim. 5:21). The Bible nowhere places an exact number on the quantity of angels. However, there are enough inexact descriptions of the angelic population to provide a general idea by considering these clues. 1. 1 Kings 22:19; 2 Chronicles 18:18: Micaiah saw the Lord sitting on his throne with all the host of heaven standing around him. The word picture portrays a scene in which the angels of heaven seem to be as innumerable as the actual stars of heaven (Gen. 15:5; Job 38:7; Pss. 103:21; 148:2). 2. 2 Kings 19:35 (see Isa. 37:36): On one night, the angel of the Lord slew 185,000 Assyrian soldiers in Sennacherib’s army, which caused the king to retreat in defeat. This kill ratio magnifies the strength of just one angel. 3. Daniel 7:10: In Daniel’s vision of God’s throne room, he saw thousands upon thousands and ten thousand upon ten thousand angels. 4. 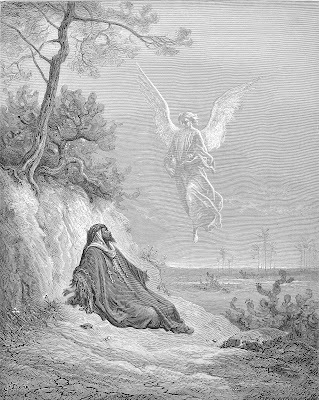 Matthew 26:53: Christ told the soldiers in the garden of Gethsemane that if he were to request it, God would send “more than twelve legions of angels to rescue him.” That calculates as approximately six thousand soldiers per legion times twelve, equaling at least seventy-two thousand angels. Actually, the number would exceed this. The sense is that an overwhelmingly large army of angels could be dispatched instantly to overpower the more than six hundred or so soldiers in the Roman cohort and accompanying mob that showed up to arrest Christ. 5. Luke 2:13: In recounting the birth of Christ, Luke describes a “multitude” (Gk. plēthos) of the heavenly host suddenly appearing and singing a doxology appropriate to the moment. In Hebrews 11:12, this same Greek word is used to describe the numerical scope of all the stars in heaven, making the enormity of the angelic army begin to become more evident. 6. Hebrews 12:22: The writer of Hebrews describes the size of the angelic court in heaven as “innumerable.” This is a translation of the Greek term murias, which literally means “ten thousand,” a number beyond which the ancients did not conceive or count. 7. Revelation 5:11: The angelic scene in heaven is described as “numbering myriads of myriads and thousands of thousands,” which meant, in other words, a number that far exceeds ten thousand times ten thousand (or one hundred million) and one thousand times one thousand (or one million). This is the most striking statement in Scripture that describes the number of holy angels as exceedingly incalculable (Deut. 33:2; Ps. 68:17; Dan. 7:10; Jude 14). The population of holy angels is obviously twice that of evil angels. The number of them is not revealed, so it is beyond our understanding. Needless to say, there is no shortage of angels at God’s disposal to carry out his will and to render appropriate worship and praise to their Creator. The term translated “heaven” in the Bible describes three different elevation levels above planet earth. First, in descending order, comes the “third heaven” or paradise, which is the heaven of God’s presence (2 Cor. 12:2–3; cf. Ps. 123:1). It is referred to as (1) “the highest heaven” (1 Kings 8:27; Ps. 148:4), (2) the “heaven of heavens” (Deut. 10:14), (3) “his holy habitation in heaven” (2 Chron. 30:27), and (4) “far above all the heavens” (Eph. 4:10). Second is the stellar heaven of the sun, moon, and stars, termed the second heaven (Gen. 15:5; Ps. 8:3; Isa. 13:10; Heb. 4:14). Finally, there is the first heaven, or the earth’s atmosphere (Gen. 8:2; Deut. 11:11; 1 Kings 8:35). From creation (Job 38:4–7) through the end of Daniel’s seventieth week, holy angels reside in the third heaven except when they depart on a temporary assignment to serve God elsewhere. This is true of the seraphim (Isa. 6:1–4), the four living creatures (Rev. 4:6–11; 5:8; 14:3), Gabriel (Luke 1:19), and unfallen angels in general (1 Kings 22:19; 2 Chron. 18:18; Dan. 7:10; Matt. 18:10; 22:30; 24:36; 28:2; Mark 12:25; 13:32; Luke 2:13, 15; 12:8; 15:10; John 1:51; Heb. 12:22; Rev. 5:11; 7:1–12; 20:1). Because they normally reside in the third heaven, all angels engage in worship (Heb. 1:6). At the end of time, all angels will reside with God and all the redeemed in the new heaven and new earth (Rev. 20:1–22:21, esp. Rev. 21:12). Angels are organized into a powerful heavenly hierarchy to carry out their work. Words such as “angels,” “authorities,” “dominions,” “powers,” “rulers,” and “thrones” can describe either holy or evil angelic hierarchies in Scripture. Romans 8:38; 1 Corinthians 15:24; Ephesians 2:2; 6:12; and Colossians 2:15 most likely refer to various ranks or levels among the evil angels, that is, the demon hierarchy. Ephesians 1:21; 3:10; Colossians 1:16; and 1 Peter 3:22 most likely refer to various ranks or levels in the holy angel hierarchy. Scripture never elaborates on the specifics of these hierarchies to explain their order or function. Since Satan imitates and falsifies God’s character and kingdom characteristics, it seems likely that there is an authoritative functional hierarchy for holy angels who worship God and a parallel counterfeit hierarchy for demons who give their allegiance to Satan. The power of angels appears in both the Old and New Testaments. In the Old Testament, angels caused blindness, rescued people, and destroyed cities (Gen. 19:1–26). They struck down seventy thousand men of Jerusalem (2 Sam. 24:10–17). Angels appear to be constantly at war with demons in the heavens (Dan. 10:13, 20–21). In the New Testament, an angel moved the extremely large stone away from the entrance to Christ’s tomb (Matt. 28:2; Mark 16:3–4) and released Peter from prison (Acts 12:7–11). Herod was struck with a fatal case of worms by an angel (Acts 12:20–23). Paul referred to angels as “mighty” (2 Thess. 1:7), and Peter called them “greater in might and power” than humans (2 Pet. 2:11). In Revelation, angels will exercise power over nature (Rev. 7:1–3). Angels will execute the seven trumpet judgments (Rev. 8:2, 6) and the seven bowl judgments (Rev. 16:1–21). They will evict Satan and his angels permanently from heaven (Rev. 12:7–9). An angel will bind and incarcerate Satan for the duration of Christ’s millennial kingdom (Rev. 20:1–3). To summarize, angels are stronger than humans but not omnipotent like God (Ps. 103:20; 2 Pet. 2:11). Angels are greater than humans in knowledge but not omniscient like God (Matt. 24:36). Angels are swifter and more mobile than humans but not omnipresent like God (Dan. 9:21–23; 10:10, 14).